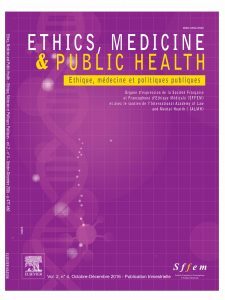 The official journal of the academy aims to compare approaches to medical ethics and bioethics in two forms, Anglo-Saxon (Ethics, Medicine and Public Health) and French (Ethique, Médecine et Politiques Publiques). Thus, in their native languages, the authors present research on the legitimacy of the practice and appreciation of the consequences of acts towards patients as compared to the limits acceptable by the community, and as illustrated by the democratic debate. The book series International Library of Ethics, Law and the New Medicine comprises volumes with an international and interdisciplinary focus. The aim of the Series is to publish books on foundational issues in (bio) ethics, law, international health care and medicine. The volumes that have already appeared in this series address aspects of aging, mental health, AIDS, preventive medicine, bioethics and many other current topics.